Mika, you're doing amazing, sweetie. Mika Riddick, 19, is a full-time employee at a local bank in Glen Burnie, Maryland. As prom season is coming up for a lot of students, she has been reminiscing about her own senior prom in 2016. Riddick reflected on her gorgeous gown, getting all glammed up, and sharing it all on social media. Then she had a simple idea: She still had the prom dress — why not allow someone else to wear it? "I offered my prom dress because why not? I know so many young women are going through financial instabilities," she told BuzzFeed News. "They’re paying a thousand college fees or maybe working overtime to give their paychecks to their families. These are all the things I’ve witnessed young women go through while I was in school. Or, honestly, there are just girls who are struggling to find a dress." So on Tuesday, Riddick retweeted her 2016 tweet to show people the dress she wore, and captioned a new tweet offering her dress to anyone in her local area who needed one. She also offered the shoes she wore that night, as well as "a makeup artist if you need that as well," she wrote. She said the responses were immediate and overwhelming. Strangers were touched she even had the thought. "I wasn’t expecting all the love because this is so normal to me," she said. "I was happy others were happy." Riddick said she got a lot of private messages — not only from those who were interested, but from a lot of young women who would have appreciated this gesture when they were in high school. There was a lot of interest, but she said a girl came to her house with her mom to try on the dress immediately. It was a perfect fit. "Her mother cried and it made me so happy...not to see her tears but to relieve her stress," Riddick said. 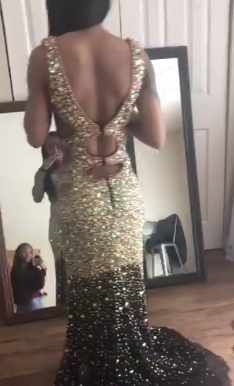 She offered the girl her dress for her prom date on April 28. "She explained her situation to me and I really just wanted her and all other girls or anyone out there to know you are not alone in your situation," Riddick said. BuzzFeed News has reached out to the high schooler who will be styled by Riddick that evening. Riddick has now inspired others to lend out their prom dresses. They're jumping in on her thread to see if there's a match for any local high schoolers in their areas. @CHIC4MASDULCE 😭I wanna joinnnnnnn! I have A prom dress I’m willing to give away for free size 14 dm if interested! "I was so excited," she said of the how quickly other women pitched in. "Seeing others become selfless makes me feel warm. We need more of that in today’s society." "Prom can be so stressful," she added. "It’s supposed to be enjoyed."